Zoe's Ghana Kitchen is holding a two month residency at The King & Co in Clapham, for April & May 2019, returning to the pub 4 years after her last residency. In the meantime she's become famous for writing her own cook book, run a restaurant in Brixton, and had other residencies in North and East London. Come for her new menu, including the slow-cooked Lamb Shank - which I'm told is stunning! "Internationally-renowned chef Zoe Adjonyoh is bringing her popular Ghana Kitchen back to The King & Co for a highly-anticipated two-month residency. 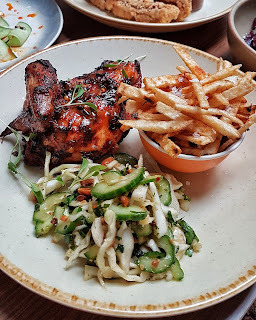 Described by the Observer as a “standard bearer for West African food”, Zoe will serve her delicious, soulful take on Ghanaian food Monday-Saturday from Monday, April 1 until Saturday, June 1. The menu will showcase Ghanaian ingredients with modern methods and feature a mix of Ghana Kitchen classics such as addictive Okra Fries, JFC (Jollof Fried Chicken) and Red Red Vegan Bean Stew, alongside exciting new dishes. Zoe’s world-famous groundnut stew returns as a stunning showstopper with slow-cooked Lamb Shank, and diners can also feast on Pork Belly Brined with Supermalt and Plantain, Suya Roasted Corn Salad and Mackerel in Chilli, Lemon and Garlic. Zoe says: “I’m thrilled to be returning to The King & Co. I cut my teeth in residencies here five years ago and can’t wait to bring all the recipes I’ve honed and discovered in that time back to the pub. Ghana Kitchen will also be hosting supperclubs at the pub where guests can enjoy a selection of most of the menu items in one sitting, as well as specials that will be served throughout the residency. Zoe has been making waves in the food scene ever since her first sell-out supper clubs in 2010 at her home in Hackney Wick. She was named one of “London’s hottest chefs” by Time Out and most recently has been included as one of ‘The 44 Best Female Chefs in the World’ by Hachette Cuisine France. In the last five years Zoe has built a reputation as an authority on West African cooking, touring the world teaching and learning. She also released her debut cookbook, Zoe’s Ghana Kitchen, and serves food to thousands over the summer on the festival circuit. Born to a Ghanaian father and Irish mother, the writer and chef from South-East London deepened her understanding of West African cuisine after a trip to visit her extended family in Ghana. There she spent time exploring recipes in her grandmother’s kitchen and at the famous Kaneshi street market."